I have been looking at curvy for a while and I'm thinking of getting it to create a rollercoaster. Most of it seems straight forward looking at the train demo/tutorial but there a a few parts that are different for a rollercoaster and I don't know if this is possible with curvy. - Track design: I want to extrude the track of the coaster, but the tutorial only shows how to extrude connected shapes. 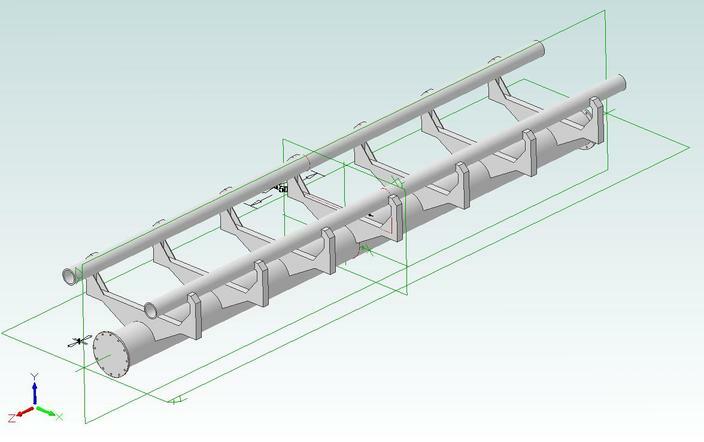 I guess I would have to generate seperate meshes for each of the three track beams (left rail, right rail and the lower middle support rail)? And then spot the part that holds them together along the track? Or is there an easier way. - Switch track: Looking at the multitrack demo's it is a bit hard to see with the moving trains but it looks like two tracks just intersect. What I would like to do is create an actual switch section (and animate it). Would this be possible if the track is generated? - Placing points: How easy is it to place controlpoints along a line? I know I can set the position manually but if the line is not straight across an axis what would be the best way to place them? The switch section is what is currently holding me back from deciding to use curvy but if this doable from what I have seen this would be the perfect tool! (08-02-2018, 08:56 AM)RavenLiquid Wrote: And then spot the part that holds them together along the track? Sorry but I couldn't understand this sentence. What do you mean by spotting in this context? Based on the track intersections I saw on google images, you can reproduce the same thing using Curvy by generating track meshs and automatically placing objects along the splines, while specifying track sections where the generation and/or placement should not be done. * the UI: either by clicking manually in the scene, or by using tools that add/remove/move control points automatically. Mainly the Shift and Subdivide tools. * the API: all the UI functionality is available, plus you can code your own control points placing logic. But it is possible to not generate rails for the area that the switch occupies but still have the spline be a closed loop with a connection for the branch? As for the placement, the idea is to trace a blueprint so it is going to be a manual labor thing hence the question. Any way thanks for the confidence so far! I think this is exactly what I need. You are correct. I see now. (08-02-2018, 02:12 PM)RavenLiquid Wrote: But it is possible to not generate rails for the area that the switch occupies but still have the spline be a closed loop with a connection for the branch? (08-02-2018, 02:12 PM)RavenLiquid Wrote: As for the placement, the idea is to trace a blueprint so it is going to be a manual labor thing hence the question. If you can formalize your intersections, you can use the API to code a script that will do the configuration for you. (08-02-2018, 02:12 PM)RavenLiquid Wrote: Any way thanks for the confidence so far! I think this is exactly what I need.